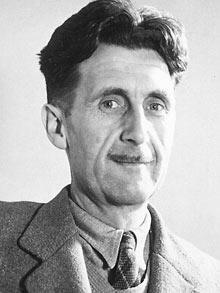 The essays and novels of George Orwell were a major influence for Anthony Burgess. 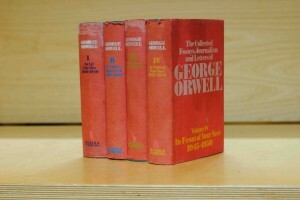 In the book collection at the International Anthony Burgess Foundation, there is the well-thumbed, four volume edition of Orwell’s complete essays, journalism and letters. Burgess has inserted a card in volume four, on which he has made notes on the essay ‘The Prevention of Literature’ and Orwell’s review of We by E.I. Zamyatin, two texts which demonstrate Orwell’s strong interest in political dystopia. ‘Freedom is so painful an obligation that there will always be some who would prefer to abandon it. The virtue of a book like Nineteen Eighty-Four — or Zamyatin’s We, or Huxley’s Brave New World, or Wells’s When the Sleeper Awakes, or David Karp’s One, or even More’s Utopia — is its capacity to remind us that the freedom of responsible human beings is not that of proles or animals. If 1984 is no more terrifying a year than 1983, that will partly be because Nineteen Eighty-Four has done its work’. Burgess’s dystopian novels redeploy some of the conventions pioneered by Orwell in Nineteen Eighty-Four. The Wanting Seed examines the role of the State in controlling the growing population of Britain, and the totalitarian methods that might be used to enforce population control. For example, when overpopulation reaches critical levels and there are mass food shortages, the government adopts a military structure and sends soldiers to a perpetual war while at the same time promising them food. The war, it is revealed, is not against an enemy but against another platoon of British soldiers, and its sole purpose is to thin the numbers. A Clockwork Orange examines the ideas of freedom and state brainwashing, which can also be seen in Orwell’s novel, as Winston Smith undergoes reconditioning by the Party. 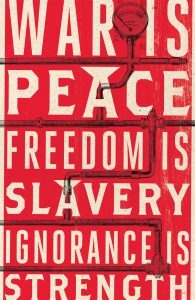 Published in 1978, Burgess’s 1985 is strongly influenced by Orwell. The second half, a novella depicting a future where the trade unions have overtaken society, is clearly a work of its time. Burgess is critical of popular entertainment and the people who consume it, striking firemen, street gangs and religious reformers. Nevertheless, Burgess’s close readings of Orwell and other writers combine to make his work a valuable companion, which helps readers to understand the development of political dystopian fiction in the twentieth century.